Flint, along with our design partner JKAE, is honored to be selected for this signature project at the Casa Roble Fundamental High School. Flint’s David Garner is a Casa Roble graduate and is leading the project team. Dave is excited to return to his former high school and make a difference for a new generation of students. 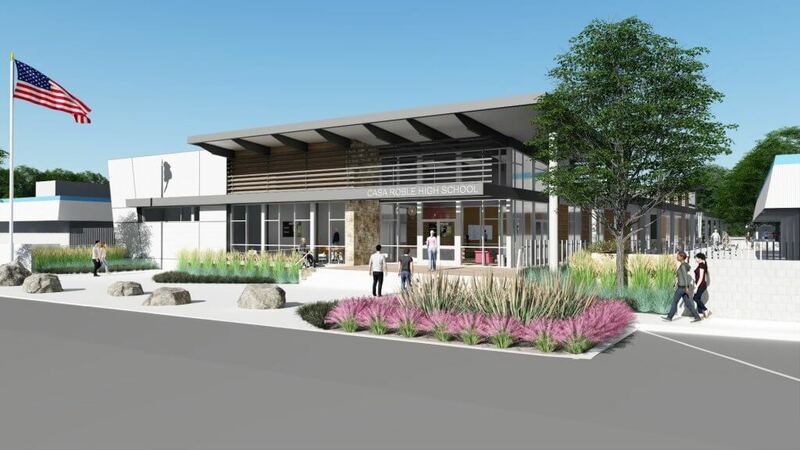 The Casa Roble Fundamental High School Student Union and Administration project includes demolition of an existing administration building, demolition of the library/counseling center and construction of a new 17,400 square-foot student-centered building that establishes a new heart of this campus. The new student union will house administration, counseling, library, and flexible/collaboration spaces, including a coffee lounge and student store (Ram Shack). A welcoming entry lobby will create a sense of invitation while also providing for a visual oversight of the campus entry and front parking lot. The single point of access will provide improved control and security for the entire campus. The coffee lounge and student collaboration space will look out to the new quad, stage, and amphitheater. Dining patios, variety of seating, and shade structures will help tie together the indoor and outdoor spaces and provide a dynamic student environment.